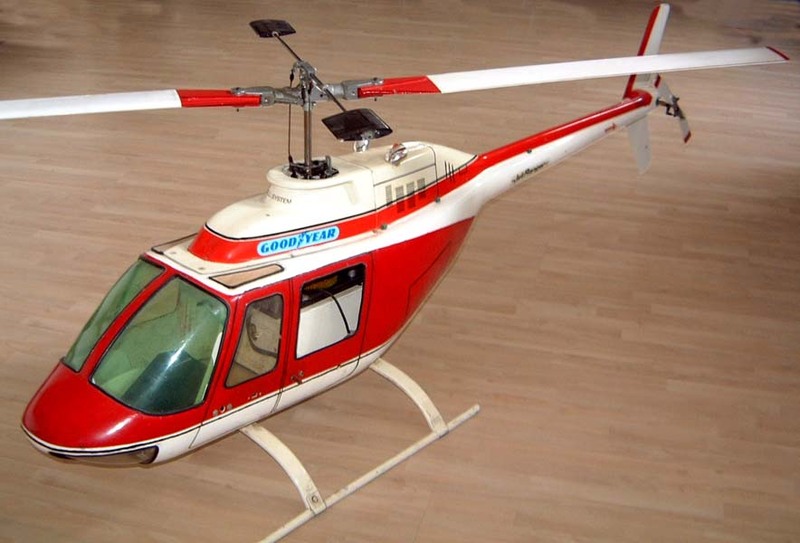 1600 mm / 63 "
Kavan approached FW Biesterfeld in 1971 with a view to developing and marketing his Radio Controlled Helicopter model and although Biesterfeld had a near functioning model Bell Huey, it was decided to provide a contrast to the Schlüter Cobra by kitting the most well know civilian helicopter; the Bell JetRanger The prototype was displayed late in 1972 and subsequently marketed in 1973 being the first (commercially produced) model helicopter with collective pitch control. The model was very near scale and was of very high quality materials. 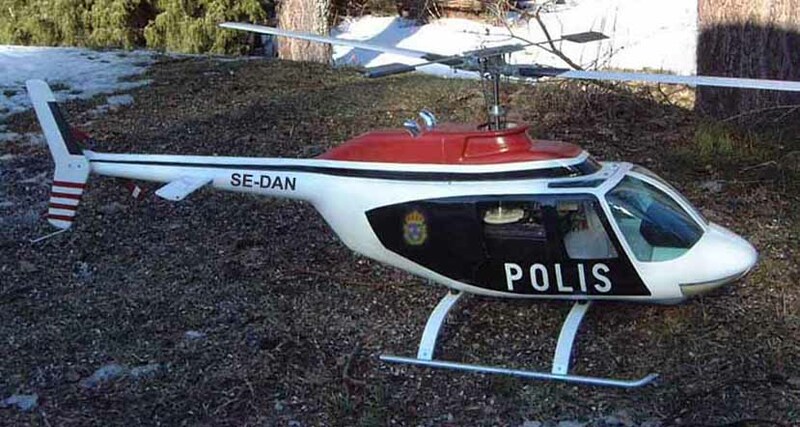 Initially the Kavan JetRanger had collective pitch but with only 'Bell' control i.e. flybar with weights and NOT paddles. This type of control provided a high level of stability for hovering and the model was not unduly disturbed by gusts etc. This control system was faster than the Hiller only types and the inherent stability of the Bell system meant that when a control input was given, the Bell bar moved in opposition to the main rotor as it had a lower centrifugal mass; this opposite movement had the effect of reducing the actual cyclic throw at the main blades. Unfortunately it could only cope with limited flight conditions and a number of test flyers lost control during high speed banked turns because of not having enough control authority (and probably positive pitch) to recover in time; especially if at a low altitude. 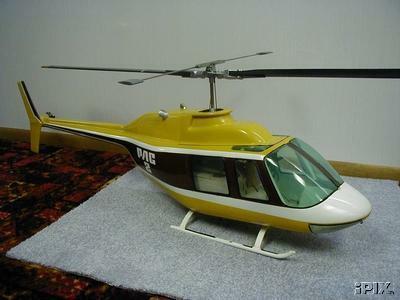 Another unusual feature of the model was that the top housing carried all the controls for the rotor head and was held in place by six screws which made removal for maintenance an extremely simple and quick procedure. The engine unit was also a 'bolt in' pod and so maintenance on this area was quickly accessible after the top cover was removed. Because of the problems experienced by the 'Bell' only stabilisation, production models incorporated paddles instead of weights which provided a measure of opposition to the defection on the Bell bar with cyclic input thus giving larger 'effective' control throws. Whilst improving control over the original format it did not provide the full answer as the paddles themselves were not positively controlled. 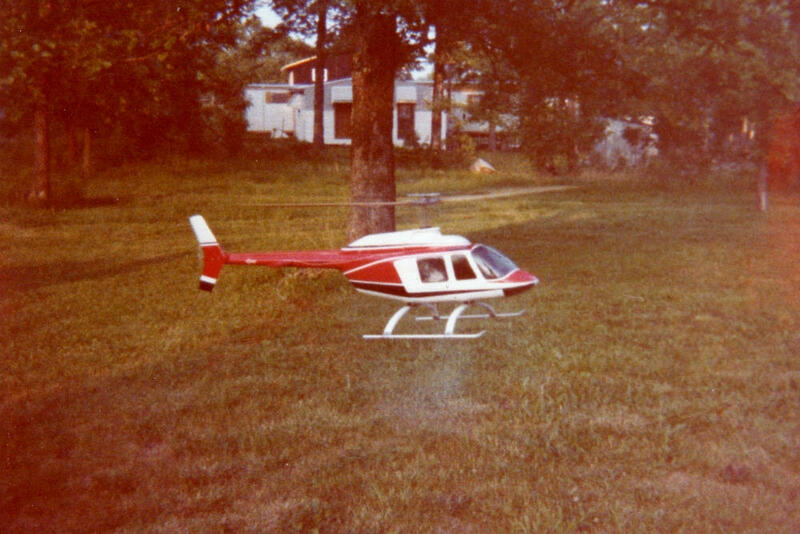 1973 saw the Kavan JetRanger win a lot of major contents however, when you consider the competition was fixed pitch helicopters or own designs then it was to be expected. To provide a more effective control system the head assembly was later modified to include a flybar with Hiller control thus giving the combined Bell-Hiller mixing that was to become the 'norm' by the end of the decade. Cyclic control was now much improved though the standard configuration still resulted in a reasonably 'tame' set up; given that it was collective pitch and gyro's were generally fitted, it was probably for the best otherwise tail control would have been nigh on impossible. Original Hiller conversion & schematic Original Hiller washout modification. Kit improvements - Jan 1974 article on a number of modifications made to the kit in light of operating experience. Whilst other have claimed to have looped helicopters before this time the JetRanger was the first to perform a true round loop. 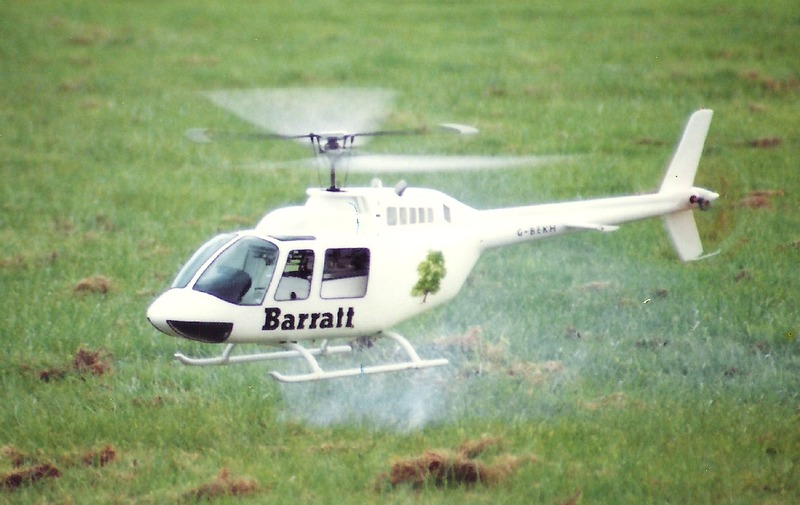 This manoeuvre could only be done with the facility to alter the main rotor blade pitch as zero, or negative pitch is required at the 'top' in order to prevent the manoeuvre from ending up as a figure '9'. This was first demonstrated before an estimated crowd number of 25,000 early in 1974 by Mike Bosch. 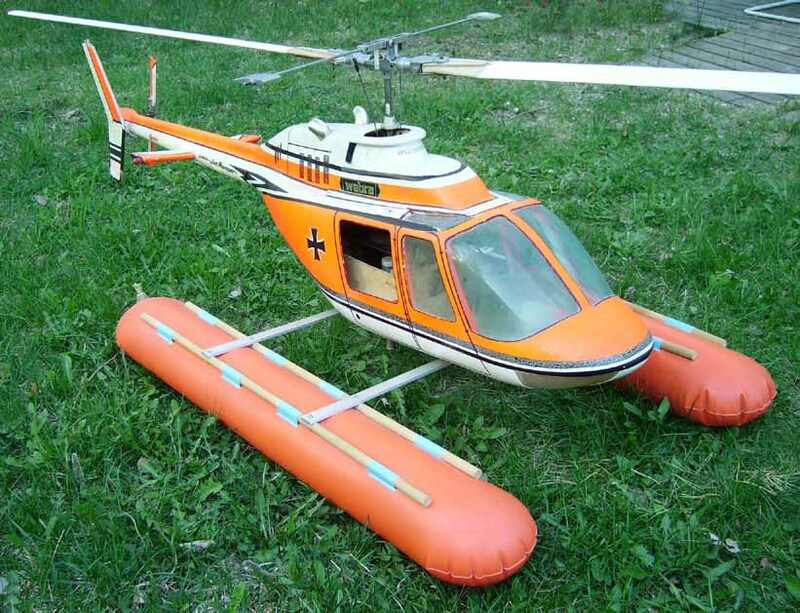 During 1974 the JetRanger was also displayed carrying out a 'roll' which again required zero or negative pitch at the inverted stage in order to keep it reasonably straight and not lose height. 1974 advert featuring an article on the further development of the JetRanger using an very expensive test method; not normally done today never mind at the start of the hobby and shows how seriously Franz Kavan took the subject. The 'history' page is useful though you have to take the initial statement 'with a pinch of salt'. 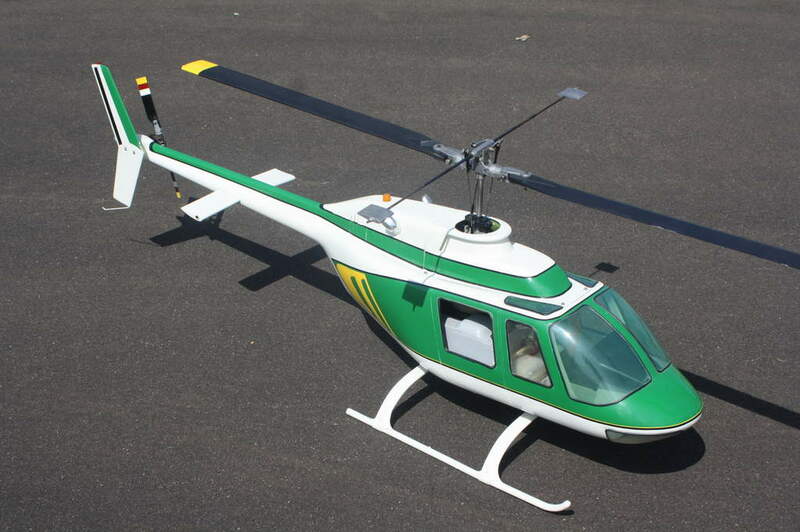 It might have only took two years to produce the JetRanger once Kavan came on the scene however, Biesterfeld had been working on his 'Huey' for a few years before that and this should also be included in the 'total' development timescale. In about 1975 after hovering 6,000 gallons of fuel and never getting into forward flight (myself) a gust of wind got me there un planned. After fighting with a heli 75' in the air, disorientation over road ability. Amazingly the crash didn't break but one windshield post and general overall dinged up my heli. I've looked at it now for 35 years and with the help of a 28 yr old lad, have learned how to get into and out of and enjoy scale heli flight. That being said, it's in the future again. The heli was at one time in forward flight by other than me. 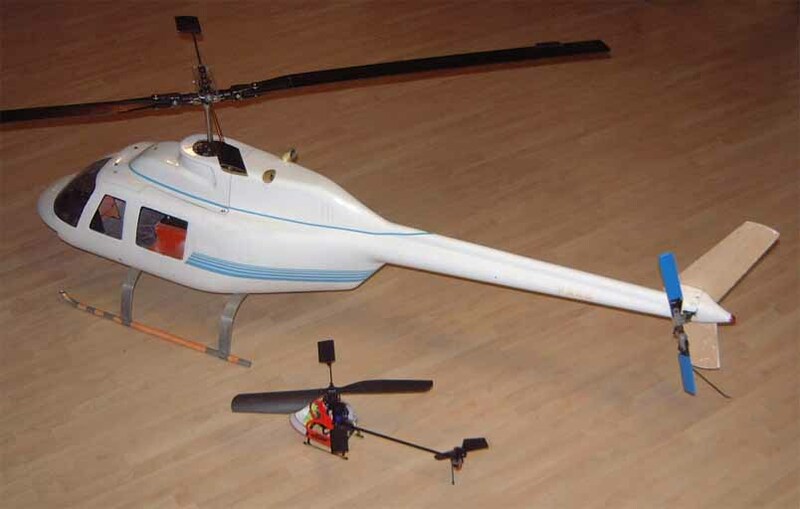 John Gorham flew it on a day he was demonstrating his heli-boy to the Denver crowd. Various constructional views of the version 2 Bell/Hiller model. early 1980 advert - note they still used the original picture of the model with bell only stabilisation...!!! 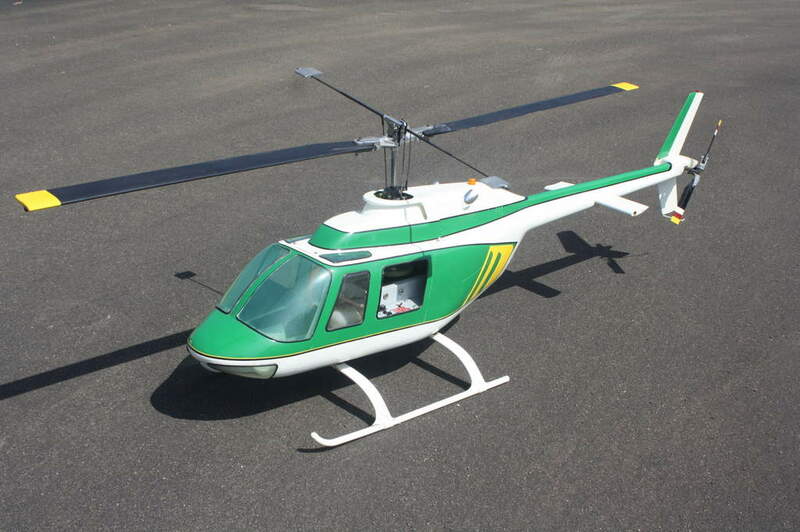 1980 and Kavan introduced their freewheel autorotation clutch for the JetRanger thus allowing the model to stay competitive. Helipad - Kavan JetRanger review by John Heaton from Mar 1982. As can be seen even by the mid 80's the JetRanger was a viable model due in no small part to it still being considered one of the best scale fuselages. Last pictures shows what can happen when a JetRanger tips over.... As the top cover was very substantial due to locating the servo's and linkages etc as a unit, in a mishap it stays intact and just rips up the fuselage beneath it. 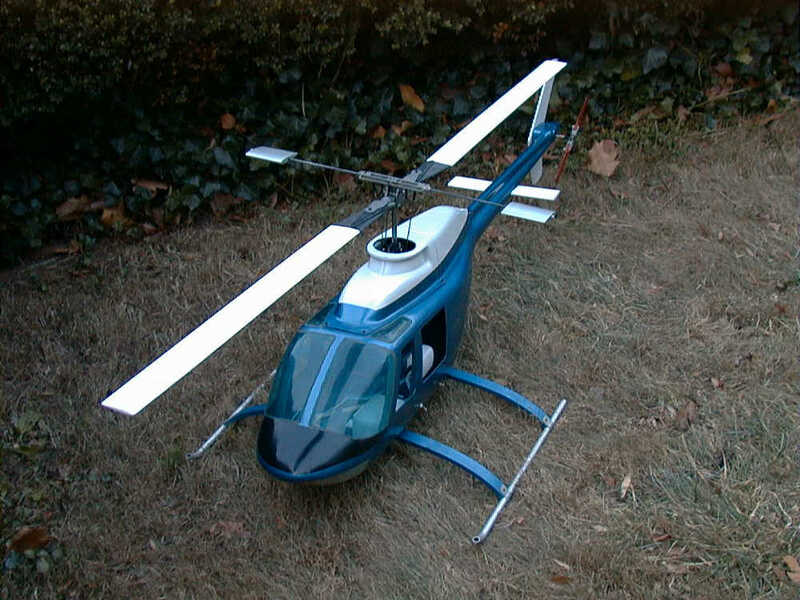 In 1979 the JetRanger was also made available as a rigid rotor (Flybarless) model as well as in the 'standard' flybar form; only goes to show as even 30 years later (prior to the FBL electronic 'revolution') they were considered difficult to fly. Notes for these pictures would indicate the year as 1978 for this Kavan JetRanger Flybarless model; flybar carrier has been removed and a fixed block fitted in order to attach the original mixer arms so as to retain the collective movement, home design as the official version did not come out until later and used a completely different looking rotor head.